For debugging process control functions in the inspection phase of a DCS application, traditionally system engineers have prepared panels for testing each function, in addition to operation and monitoring test panels. Further effective improvement in engineering efficiency would be if these test panels could be generated easily and automatically. The first two reports in this series introduced the tools for converting an I/O list to a DCS database and for reusing a DCS application. 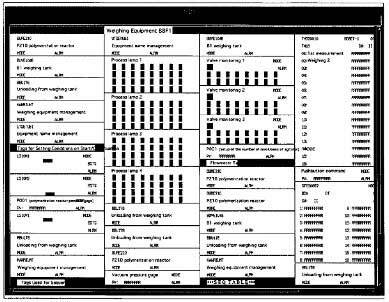 This report introduces the "Test Panel," another effective tool in the inspection phase of DCS application engineering. To improve efficiency and quality in the DCS application coding and inspection phases for an entire CENTUM CS system, engineering tools have been developed, along with the training required to operate these tools. In consideration of the time needed for development, the need for adequate operability, the basis of standard CS software architecture, and the use of freeware (e.g., Perl2 and Tcl/Tk3), we began development of these engineering tools with the objectives to reduce development costs and increase efficiency. As a result, our CS I/O List tool allows an open engineering environment as well as increased efficiency by eliminating redundant work over sequential engineering phases; also, the EXSA Module has improved quality and efficiency in the engineering and coding phases by allowing a DCS application to be broken down into reusable function components. This report introduces Test Panel, an engineering tool developed to improve efficiency in the inspection phase of DCS applications by making effective use of its operability. The Test Panel allows the easy, automatic generation of process monitoring and operation panels essential in plant control. The Test Panel is based on the debugging support panel tool provided at the operator station of a CENTUM-XL. Even with this debugging tool, engineers still had to prepare as many operation and monitoring panels as needed for efficient debugging of process controls in the inspection phase of a DCS application. At present, the CENTUM CS has become the mainstay. Accordingly, in consideration of a successor to the CENTUM-XL tool, the differences in the platforms, and the use of standard CENTUM CS panels (graphic panels), we have developed a brand-new engineering tool for the CENTUM CS which allows the automatic generation of panels for debugging in order to increase engineering efficiency. This tool is the "Test Panel." In addition, the standard features of a CENTUM CS system include, besides the ability to generate databases (i.e., various system builders), functions to test a DCS application generated with such engineering tools as the I/O List tool and EXSA module, allowing engineers to conduct fundamental process control tests at an engineering workstation. The inspection phase for a DCS application is divided into sequential stages: checks on paper, unit inspections, and integration tests. Through these stages, quality is verified and assured. We have been developing various tools for engineers to use that will afford more effective debugging at an engineering workstation in unit inspections and integration tests than standard test functions alone provide. 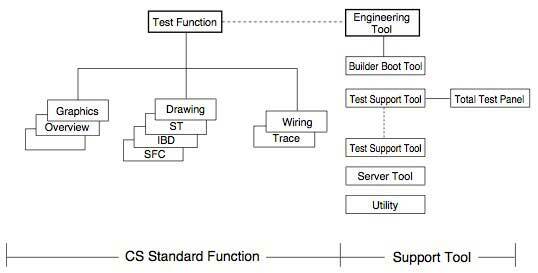 Figure 1 shows the relationship between the CENTUM CS's standard test functions and engineering tools. The Test Panel is positioned as a test support tool to help in debugging at a workstation or ICS (a CENTUM CS operator station) in unit inspections and integration tests. A test panel displays the information needed for process operation and monitoring, such as process data values and instrument statuses, in the separate display blocks for each tag. Each test panel is generated using a CENTUM CS standard graphic panel. An example of a test panel is shown in Figure 2. The following describes the operation and monitoring functions of a test panel. To allow flexible configuration of operation and monitoring panels, full-sized and half-sized standard graphic panels are generated automatically. With adequate consideration given to debugging operations and clarity, the sizes of characters and some blocks differ between the full-sized and half-sized panels. For operation and monitoring in debugging, diverse information on related function blocks must be displayed in various formats. How effectively requisite information can be displayed on a panel is a key point for test panels. Hence, extensive display block types are prepared and the automatic generation function assigns a display block according to the type of function block. For the types of display blocks, see the test panel generation function in the next section. The modification function, one of the standard graphic panel functions, changes the attribute of a primitive according to a specified process status (e.g., a process value or status) to allow the user to identify the particular status visually. Depending on the aforementioned display block type, various modification conditions are set. For instance, the background color of a display block for a timer changes, allowing the user to visually identify the time-up. Touching a display block within its borders will retrieve the faceplate window of the corresponding defined tag. See the example in Figure 2. As shown in the figure, most display blocks allow the user to retrieve the faceplate window of a corresponding tag, facilitating operation and monitoring in debugging. Raw data (i.e., data from a process without any input processing) can be set to simulate a change in the process value of an instrument not actually connected to a process. By pressing the RAW softkey at the lower left on the panel, a dialog box appears that is used exclusively for the entry of raw data (see the example in Figure 2). Consequently touching a display block for which you want to enter raw data retrieves faceplate window, allowing easy entry of data. Operation and monitoring panels (source files of graphic panels) used in plant operations and monitoring. This function allows the user to generate new panel configuration files manually and customize panel configurations that were generated automatically. This function generates the source files of graphic panels used as test panels based on source files defined by the panel- configuration customization function above. These functions are explained in the following section in the order of operation. 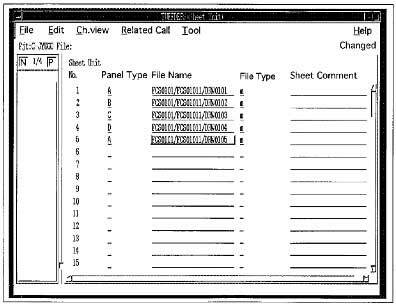 Source files of graphic panels used as operation and monitoring panels in actual plant operations. This function automatically creates panel configuration files that will be described later, and generates test panels (source files of graphic panels). First specify the drawing source files that define the process controls. Figure 3 shows the extraction definition window. 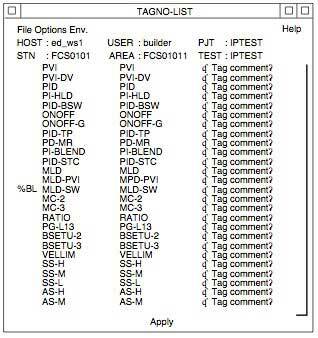 By selecting the drawings related to debugging for each process control, the tag data related to each process unit will be extracted. For each control drawing assigned a Sheet Unit number in the extraction definition window, a test panel is generated. For each group of control drawings assigned a Group Unit number, a test panel is generated. This is effective when control of a process unit is covered by two or more control drawings. Function blocks to be extracted are classified into four main categories, and the function block models of each category are further classified depending on their functions. According to this classification and the specified panel type, the automatic generation function extracts the function blocks from the specified control drawings and then generates easy- to-identify panels suitable for the purpose of debugging. There are four panel types: A, B, C, and D. Table 1 describes the function of each panel type and the function block type that is extracted for each panel type. As shown in this table, the panel type determines what kind of function block is to be extracted, allowing the generation of operation and monitoring panels suitable for debugging. Using the differences between panel types, the display blocks to which function blocks are assigned vary, and the panels can be differentiated. (All-block panel) All function blocks, defined in control drawings, are extracted. (Process monitoring panel 2) All function blocks, defined in sequence control blocks only, are extracted. (Internally calculated data panel) Internal-calculation control blocks are extracted only. The following function blocks refer to the tag data within a block itself. Of special note, a sequence table block refers to many other tags, and these tag data and the sequence table block are assigned together to the same test panel as one set of information. 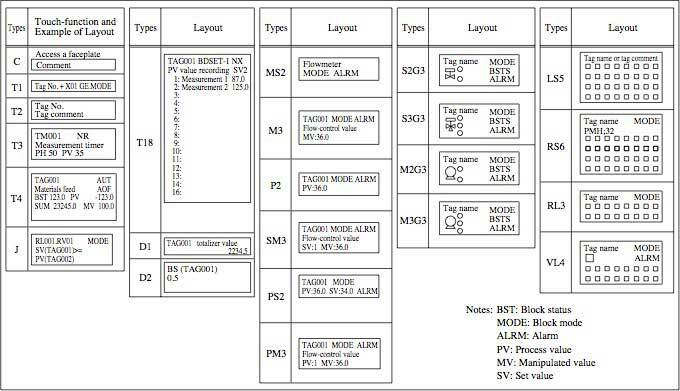 Tag data can be extracted for generating test panels from graphic panels that are used in actual plant operations and monitoring. The panels thus generated are effective for unit inspections of graphic panels, such as when checking the modification conditions. The panel configuration files created by the aforementioned tag data extraction function can be customized. Also, a panel configuration file can be manually created by defining the desired tags one by one. The panel configuration customization window shown in Figure 4 is used to define the data necessary for generating the source files of test panels (graphic panels). The source files handled via this window are created by the aforementioned tag data extraction function. In this window, unnecessary data can be deleted and other data added, allowing the panel's configuration to be customized. However, when the automatic generation function is used, the number of records of extracted data often exceeds the allowable size for one graphic panel depending on the types of function blocks included, and it may be necessary to delete some records. This is a known problem that will be resolved in the near future. 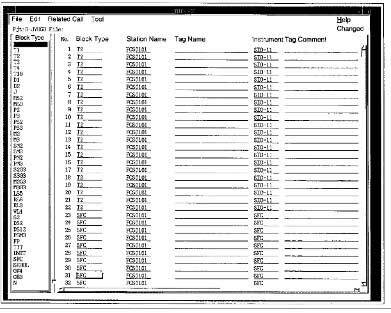 The current tag data extraction function may not always be effective if a group of control drawings is selected for generation of a single test panel or if a selected control drawing contains a great number of tags. These cases result in a lot of unnecessary tags extracted for the test panel. In such cases, assign necessary tags by using the panel configuration customization window. It is very helpful to refer to the list of tags which have already been defined by using the system builders. The list of defined tags can be viewed via the window as shown in Figure 5. For this procedure to define a panel's configuration, efficiency in the engineering is also a key factor. Select the desired tag in the tag list window, and the tag will automatically be pasted in the panel configuration customization window. This avoids typographical errors and entries with wrong tag names and function block model names. When a tag is pasted in the panel configuration customization window, the panel type, station name, and additional information for that tag are automatically set as applicable, in addition to the tag name, function block model name, and tag comment. Since almost all configuration data can be defined without the necessity for key entries if this function is used, operation mistakes can be eliminated, promising greater efficiency in engineering. This function creates the source files of test panels (graphic panels) based on the panel configuration files created by the tag data extraction function or those created or customized by the panel configuration customization function. Each record of a panel configuration file will form a display block in the test panel. Extensive selections of display blocks are prepared not simply because the number of available function block models has increased from that for the CENTUM-XL; rather, this allows presentation in various ways. Table 2 shows the list of display blocks. Each test panel for debugging as shown in Figure 2 is generated with an assortment of these display blocks. The following outlines the engineering environment in the inspection phase of a DCS application. At unit inspections, each action of a program for sequence control of a process is checked in detail. By using the CENTUM CS's standard test functions, an engineer can check the actions of each control drawing or set of control drawings grouped for a unit of process control at an engineering station. Normally, checks are made using one workstation; however, two or more may be used for a large- scale project. In this case, one workstation is set as the master, and the others as slaves, in the course of engineering. The generated test panels can be called up from the status display functions of the test functions (graphic panels) and Table 2 List of Display Blocks operate the same as the other graphic panels for status display. During unit tests, the test panels are prepared according to the need for testing, and used as the operation and monitoring panels for debugging. 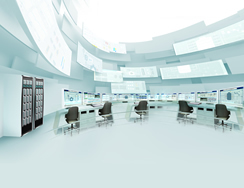 After the completion of unit inspections, integration tests are conducted with the target hardware all connected, and operation of the entire CENTUM CS system is verified. In a large-scale system, there may be multiple ICSs and engineering workstations, and instrument panels may be interconnected. When an overall system inspection is required (which may include a factory acceptance test), the entire system is configured to form an actual system (or the equivalent thereof), and all system operations are verified. At this stage, test panels play an important role in the operations needed for smooth testing. Following the tools of the debugging support functions for the CENTUM-XL, "Test Panel" succeeds as a useful engineering tool in realizing efficient inspections and leading to further improvements in quality. We would like to enhance these functions and provide an engineering tool even easier to use in the next-generation system. Note: The "Test Panel" engineering tool is for the purpose of improving the efficiency and quality of in-house engineering, and all test panels used during in-house inspections and factory acceptance tests are deleted before shipment. Hence, the user's system specifications are not modified in the least by the use of test panels.